A Podcast all about the second world war hosted by Stephen Bedard. The Second World War really starts with the German invasion of Poland. But what were Japan and Italy up to as Germany was preparing to invade? This episode looks at what was happening in China and Ethiopia in the mid to late 1930s. Can we think of two greater monsters of the 20th century than that of Hitler and Stalin. Although the Second World War ended with them as bitter enemies, it began with them in cooperation. This episode looks at what led to the nonaggression pact. The German invasion of Czechoslovakia was a turning point in Hitler's acts of aggression. This was the necessary step to transition from annexing fellow Germans in Austria to invading the non-German Poland, thus starting the Second World War. 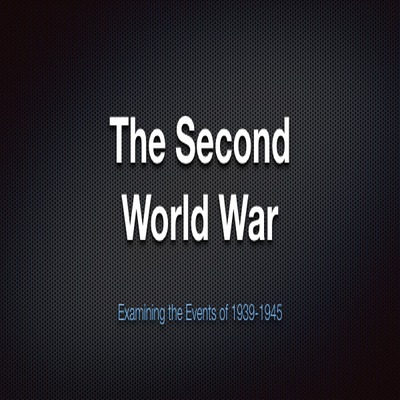 It is difficult to understand the Second World War without some concept of the First World War. Many of the seeds of what happened in 1939-1945 were planted in 1914-1918. Even some of the battles were fought on the same land by the same countries led by leaders who were in both wars. This episode provides a very broad outline of the major events of the First World War. For more details, my recommendation is Barbara Tuchman’s The Guns of August. You can get it as an audiobook and support this podcast at Audible. In this first episode, I share a little about myself and the direction of this podcast. In the episode, I mention the podcast by Ray Harris, Jr. You can find the History of WWII Podcast here. You should really check it out, it is quite good. However, I intend for my podcast to be somewhat different, reflecting my personality and interests. I hope that you will journey with me as we look at the Second World War and all of the events surrounding it. You can find out more about me at my main website.